Following my last posting (Finally, Some Sound), I had a few questions on how I mounted the electronics in the slope-back tender of the 0-6-0. Unfortunately, I did not take any photos of the tender insides but here is a diagram of what is mounted and where. 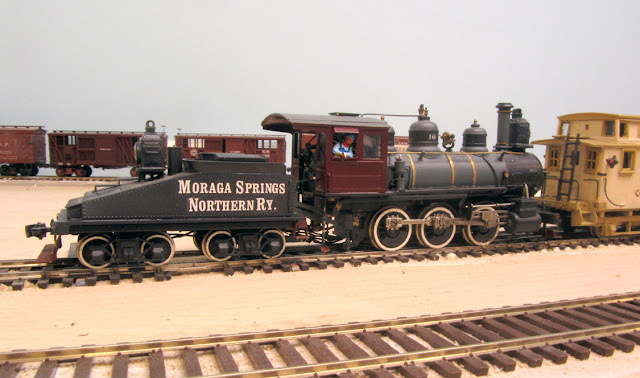 To begin with, the motor and drive was replaced with a Sagami 16x30 can motor and a NWSL 150-6 gearbox (36:1). All of the electronics mount in the back half of the tender shell. I had previously filled the coal bunker with coal and had weights in the water part adjacent to the coal. 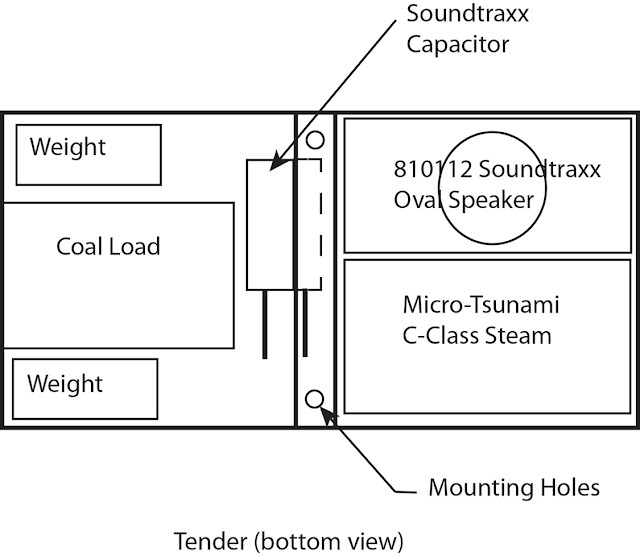 I used a Micro-Tsunami (C-Class Steam) with a Soundtraxx 810112 oval speaker. The wires for both were oriented toward the middle of the tender beneath the mounting strap. The capacitor was also mounted beneath the mounting strap. I used an incandescent 1.5V bulb for the backup light and the resistor for that was stuff in one of the legs adjacent to the coal bunker. None of these pieces was fastened to the tender body but just laid in. Three 1/8” holes were drilled in the tender floor beneath the speaker to let the sound out. An additional hole was drilled in the floor for the wires to pass through to connectors located beneath the front truck body bolster. I kept the wires as short as possible so they could all be stuffed beneath the mounting strap when assembled. It was programmed this morning and it sounds great. The Number 19 at Orford Junction. Like everyone, I work on a project for a while, get tired of it, quit, and, hopefully, get back to it some time later. A couple of years ago, I refitted almost all of my locomotives with Tsunami sound decoders. By the time I had finished most of them, I got tired of the project and left two locos silent and running with only non-sound decoders. Over the last couple of days, I finally decided to remedy that situation and install the sound decoders. 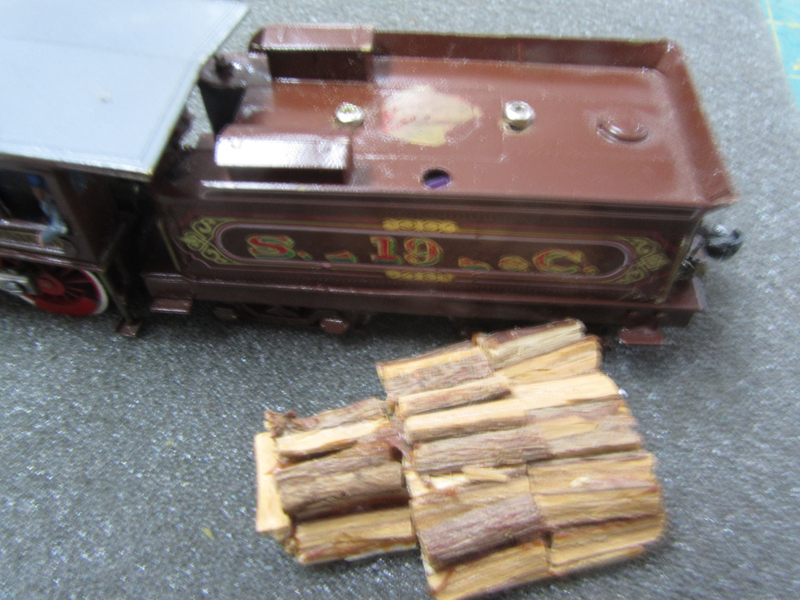 The speaker can barely be seen at the left rear corner of the tender. A Sagami 16x30 motor was used. Some of the tender frame had to be removed to allow the decoder to fit. The two engines in need were No. 19, a Pacific Fast Mail import of the V&T Reno. This engine is a 4-4-0 with the motor, decoder and speaker in the tender. There is precious little room for all these things, so little in fact, that I had to skew the motor slightly to allow the Tsunami to fit. 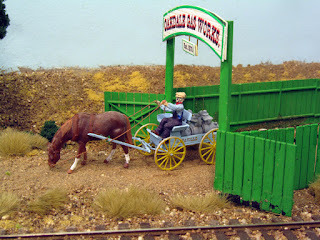 Many people think that a motor in the tender will result in "tender wobble" as the loco runs. This is not the case. If a rubber tube coupling is used between the engine and motor, you can expect the wobble but not if Northwest Short Line U-joints are used. The drive shaft between the engine and tender is not real noticeable and there is more room in the engine for weight which means long trains. My 4-4-0s pull 10-12 normal-sized cars without a problem. The speaker I used was a Soundtraxx 3/8" speaker. It's not real big but it does put out the necessary sound and it's the only one that I can get to fit. It's located at the extreme rear of the tender behind the flywheel. 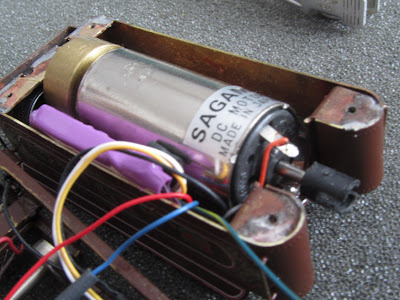 The motor is attached to the tender shell. Screws are covered by the wood load. The Number 16 at Stockton. 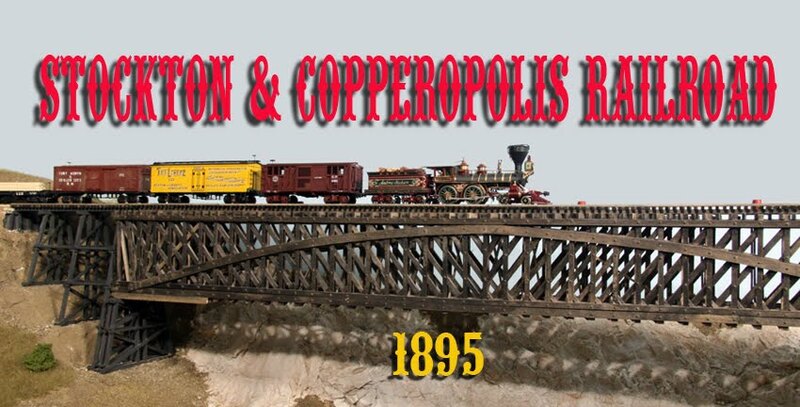 It is still lettered for the MSN but the tender will be repainted and relettered for the Stockton & Copperopolis. The other engine was No. 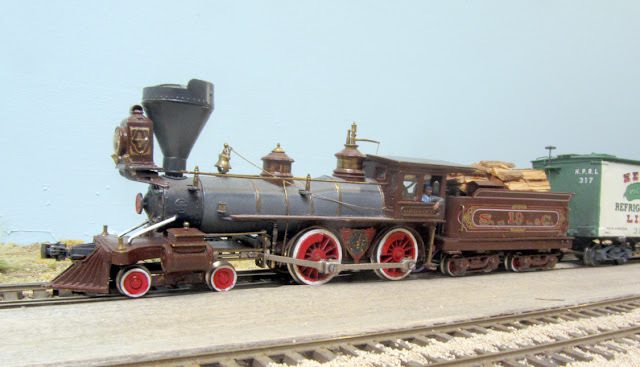 16, the Stockton switcher. 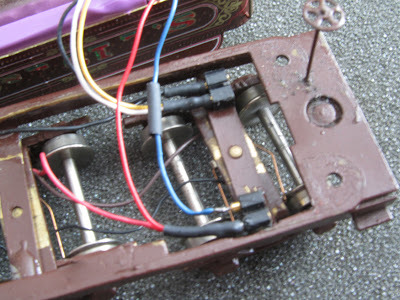 It had a small Lenz decoder in it which gave good results but no sound. Another Tsunami went in here. There was enough room to add a big larger rectangular speaker I had. Everything was a tight fit due to the slope of the tender deck but it now works well and will please the Stockton yardmaster who was complaining about having an engine without sound. I have always been fascinated with obscure industries of the nineteenth century. The ones to which I refer are those that were commonplace at the time but vanished by the early- to mid-20th century. One of these is the gas works. 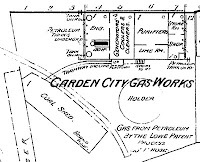 Before tapping the abundant natural gas supplies, cities who wanted gas for lighting and other duties had to manufacture their own gas. There were several different processes but most involved heating coal and capturing the gas which resulted. 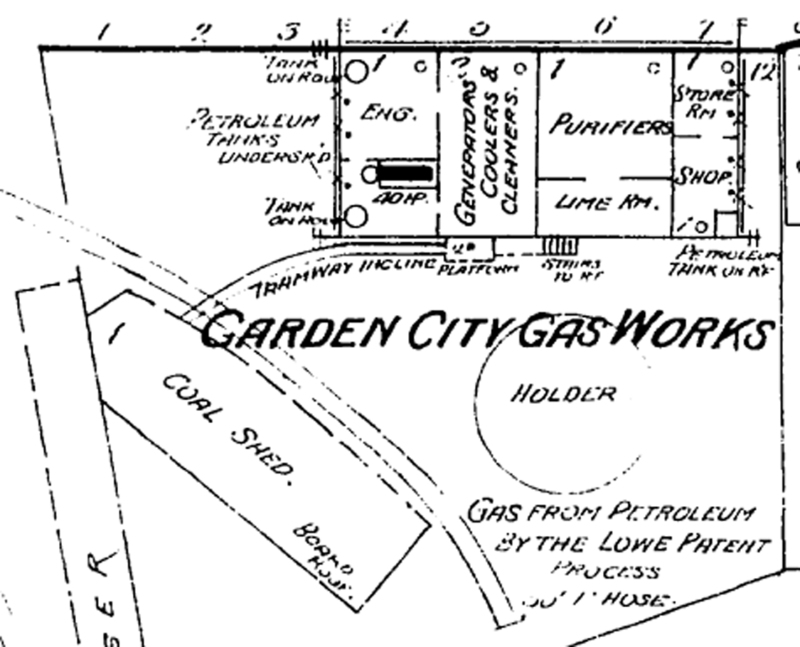 Some, such as the Lowe process, added oil to the gas. Note the coal bin at the right side of the processing building. 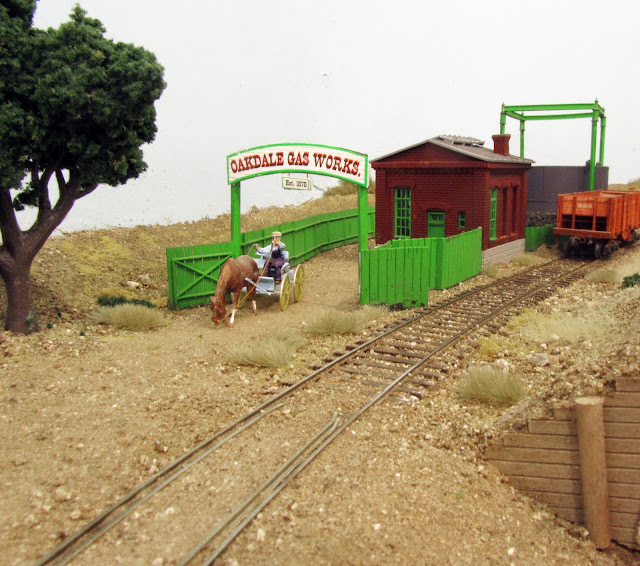 It doesn't appear that Oakdale had a gas works but I decided to add one simply because I wanted to model such a plant. 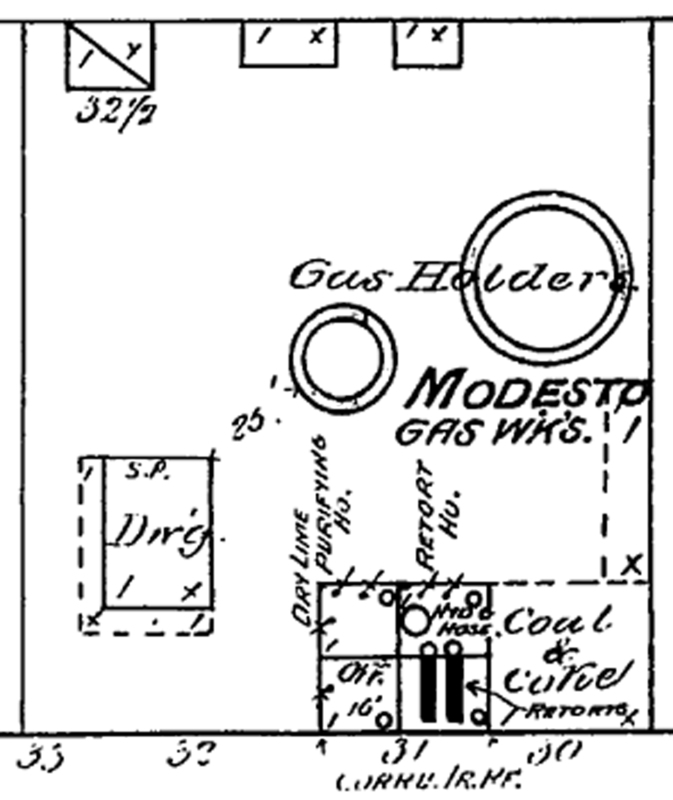 I patterned my model after the Modesto Gas Works of 1884. In that form, it used coal and had only a single gasholder which made it a bit easier for the space I had allotted. 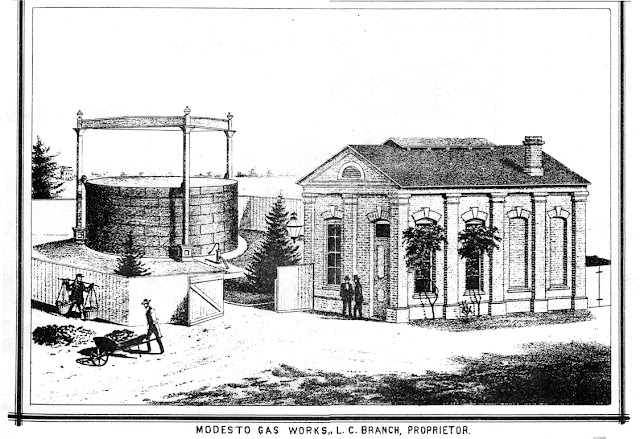 The woodcut showing the gas works was found in the History of Stanislaus County published in 1884 while the Sanborn map drawing was from 1888 after they added another gasholder. 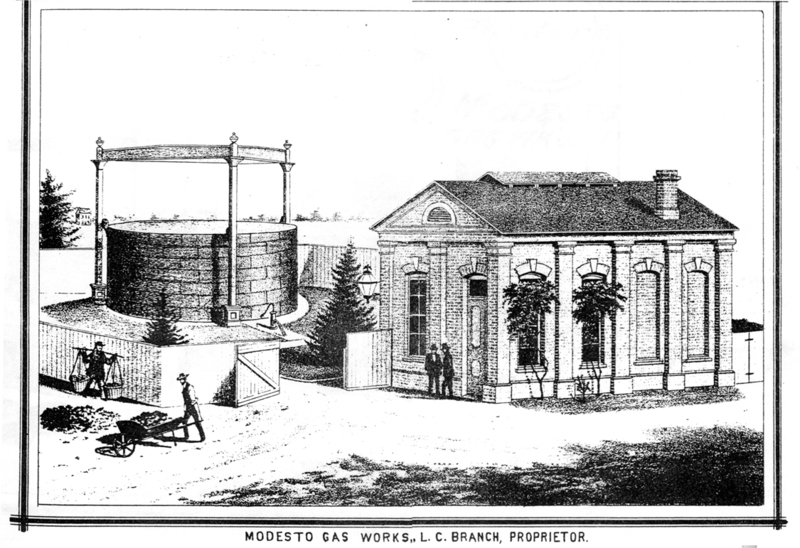 The Modesto plant was not rail-served but other plants, such as the San Jose Works were so I added a spur to provide the coal that would be needed. 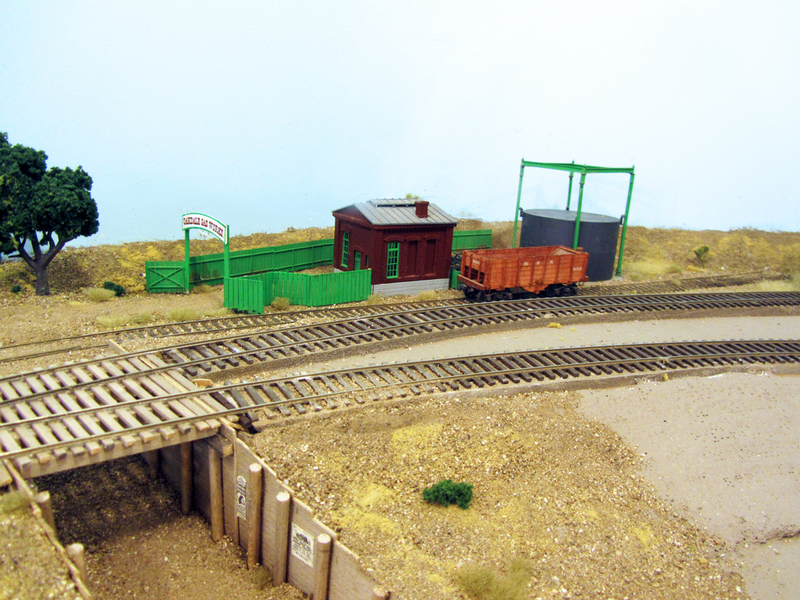 The processing building was modified from a Vollmer kit while the gasholder used a Rix tank with scratchbuilt superstructure. 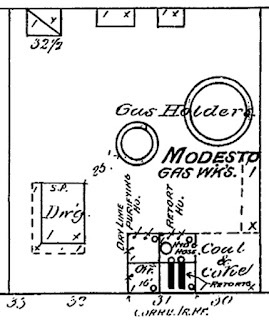 In the Modesto sketch and map, you can see the coal storage bin which was freelanced. Fencing was by Central Valley. The small gas company wagon was modified from a Jordan buckboard to more resemble a prototype wagon found at Travel Town in Los Angeles. Sometime in the future, I may "convert" the plant to the Lowe process so I can run an occasional tank car to the facility but, for now, I will leave it as it is.